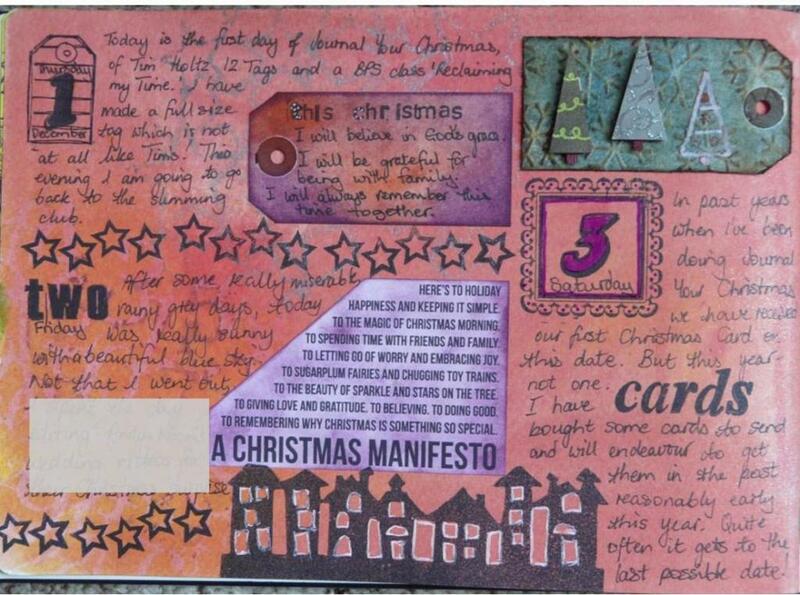 For the past few years I have been doing Journal Your Christmas with Shimelle. Once you've paid for the course you have access to it every year. Each year the themes are the same but there's always a new twist to keep it fresh. Although it is a scrapbooking class, it is possible to do it in any media or format that you choose. This year I have chosen to use the techniques I learnt with 30 Days in Your Journal and journal December. The is a little bit of journaling blocked out on the left hand page because it is about a surprise at Christmas. As I make each of the 12 tags inspired by Tim Holtz I have been trying to make a small one to stick in my journal. Come back later to see days 2 to 5 of my tags.